Lighting-Gallery-net - circline and u-bent fluorescent tubes/ful "u" fluorescent adapter from circa 1980! ful "u" fluorescent adapter from circa 1980! restore find. the adapter is usa made "watt saver", the lamp is a panasonic 14w warm white made in japan. i remember similar ones with cylinder shaped adapters back in the early 80s. That is an interesting 'old school' ballast style. Wow that is awsome!!! Preheat? yep it is preheat, it has a neon filled starter bottle inside the adapter, you can see it light up through the vent holes as it starts up. Nice find! Over here FUL's are only UV types used in bug zappers. A lot of Grey Import Toyota minivans from Japan here use them in white colour and they are hard to find replacements. Lemme guess...taken in the car right after finding at a Restore or garage sale? That is a very interesting lamp assembly! 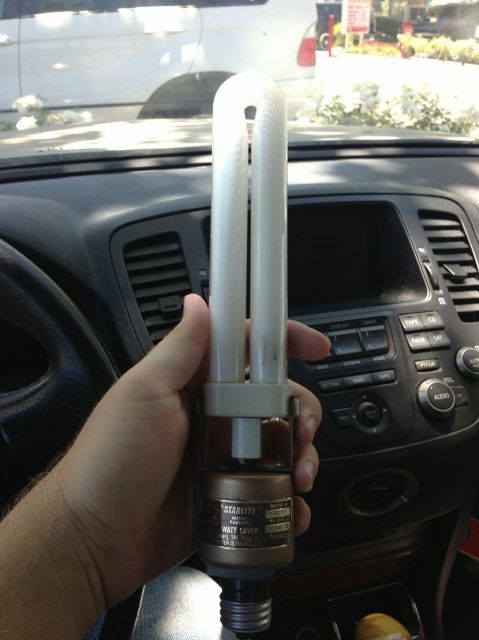 I don't think I have seen a vintage compact fluorescent adapter like that before. My first encounter was the ones from GE with the heavy bases and a Biax type lamp! Gosh I miss those! But very nice find Silverliner! Wow, that is a long assembly. That must stick out of most fixtures! Sadly, I accidentally broke the lamp last year or so. But I have since found an identical replacement. Cool adapter, so this must have been made by Lights of America before they became Lights of America.